This is an adult’s only hotel. Guests must be 18 or older. Children won't be allowed under any circumstances. 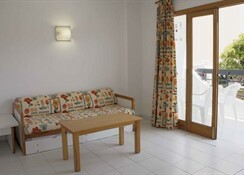 The Club B Mallorca Apartments is a collection of apartments offering a brand new experience in Magaluf. Situated in the heart of Magaluf, the Club B Mallorca Apartments is only 300 meters from the beach, and close to the most popular clubs in Mallorca, as very near to the brand new BH Mallorca. There is a range of facilities on offer including an outdoor swimming pool lined with palm trees which is ideal for cooling-off in during the day, plus there are sunbeds for guests seeking to work on their tan. There's also a snack bar at the guests' disposal as well as buffet restaurant. Additionally, all guests on all-inclusive board option at Club B Apartments also have access to the main BCM Hotel complex with pool parties and live DJ sets, which is just down the road. 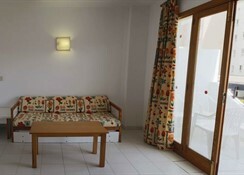 Each of the apartments on offer is decorated in a pleasant, simple style with quality furnishings. They have large rooms with big living area and come equipped with a full private bathroom with bath/shower, private balcony, safety deposit box (at extra charge), telephone and full kitchenette area with a small fridge, kettle, toaster, two electric cooking rings and basic kitchen utilities.. Please note: Damages deposit of 30 euro in cash is required per person upon arrival to the hotel, as a guarantee. This deposit will be refunded at the end of the stay (check-out), once the room has been checked. The local Sustainable Tourism Tax may be payable locally. This is an adult’s only hotel. Guests must be 18 or older. Children won't be allowed under any circumstances. Certain amenities may be payable locally. 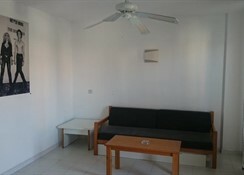 There are one-bedroom and two-bedroom apartments with two twin beds and two sofa beds in the living room. 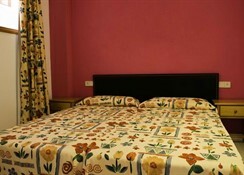 They come equipped with a full bathroom with bath/shower, large balcony, safety deposit box (at extra charge), telephone and full kitchenette area with a small fridge, kettle, toaster, two electric cooking rings and basic kitchen utilities. Air conditioning is for free from 2016. Check in is from 2pm and check out is 11am prompt. There are several boarding options to choose from. First is self-catering - kitchenettes come with a small fridge with a freezer, kettle, toaster, two cooking rings and basic kitchen utensils. Half board option includes breakfast from 9.00 until 11.00 and dinner from 19.00 until 21.00 in the buffet restaurant in BCM Hotel located 100 meters away. During dinner guests can enjoy soft drinks, beer and wine from self service area. ALL-INCLUSIVE MEALS Breakfast - 9.00-11.00 Lunch - 13.00-15.00 Dinner - 19.00-21.00 All meals served in the buffet restaurant in BCM Hotel. 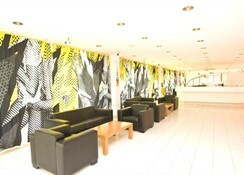 DRINKS During lunch and dinner clients can enjoy soft drinks, beer and wine from self-service area. Snacks are available between meals hours. All-inclusive bars are open from 11.00 until 20.00 always in Club B Mallorca. The all-inclusive option is available from 28.04.2016 till 24.10.2016. 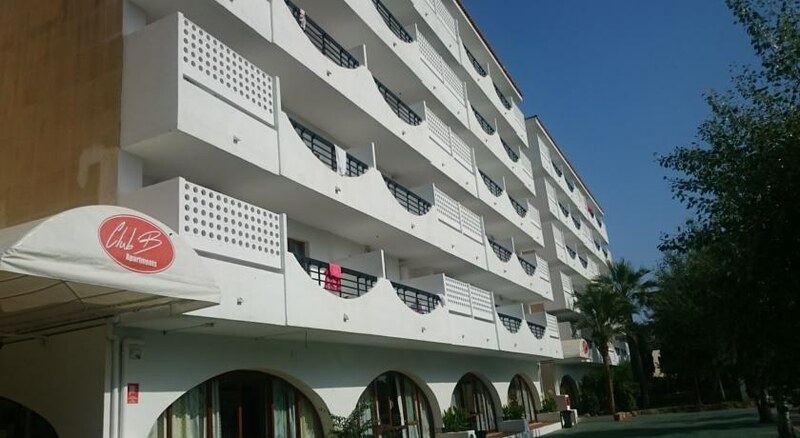 The Club B Mallorca Apartments are located in a great location in central Magaluf, close to the most popular clubs, BCM and BCM Square and two minutes’ walk from BH Mallorca featuring the world's biggest DJs. There are plenty of supermarkets, bars and restaurants in the surrounding area and the 1000 meter-long beach is just a five-minute walk away with a great range of water sports on offer for thrill seekers. The location also offers an impressive range of world-class clubs plus there is good access to the public transport in the local area and the capital city of Palma is just 15 miles away. Sporting and leisure facilities available to guests includes a large outdoor freshwater swimming pool, and spacious sun terraces and gardens which are furnished with loungers and parasols. Other leisure facilities includes a multi-sports activity area for five-a-side football and volleyball etc, and both table tennis and pool tables. The Club B Mallorca also provides a seasonal programme of daytime sporting activities, organised each day by their own resident team of entertainment staff, which features a selection of various games and activities around the pool. 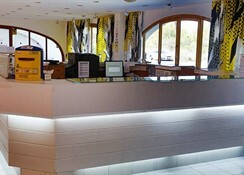 Guest facilities on offer includes a 24 hour reception area with currency exchange services, and both luggage and courtesy rooms for late departures, along with a buffet style restaurant and snack bar, offering a choice of traditional Spanish, international and vegetarian menus, laundry and medical services, public internet terminals, a games room, television lounge and both lounge and pool bars.